Perhaps some of you would like to find out more about the three Glens in Wicklow - Glen of Imaal, Glenmalure and Glendalough. It is through these Glens the fighting against the British was done in 1798. All are situated in West Wicklow and although Glendalough is a tourist area now all three Glens were once hostile. At the head of the Glen of Imaal is the fort that the Yeomanry lived in when defending 'the black banks' to stop the Fenians escaping to Glenmalure. Glenmalure although now accessible is a wild wild place - a wilderness! Bounded by Mountains the Glen of Imaal has Lug na Cuille, Derrymuck and Table Mountain surrounding it and the only route for escaping from the Glen of Imaal was the Black Banks and they are still there. The Glen is owned by the State and is used as a firing range for the Irish Army to practice in [i.e. Stranokelly woods) which are out of bounds to visitors due to live ammunition being in the woods. Crossing Derrymuck to Glendalough leads to some very beautiful scenery and dangerous terrain - it is said that Michael Dwyer rested in St. Kevin's Bed (cave in rocks over the lake) when injured during the 1798 rising. At the head of Glendalough are miners cottages (ruins) and the glen was worked and the English miners lived in the cottages there. Whether you like or not we have all a bit of English in us. My grandfather went down with his ship running the blockade for the English in 1916 - He was decorated by the Queen's Grandfather - all my mother family died overseas, her brothers died with their father Captain Christopher Wall when the Anna Linsey was shelled by the Germans and went down. Two brothers came from Armagh on my fathers side (McGahan) one Went to Dundalk and the other to Wicklow town. One was a builder and the other a solicitor. The three Glens. All three Glens are in West Wicklow, The Glen of Imaal itself, Glenmalure, and Glendalough were involved in the l798 rising. 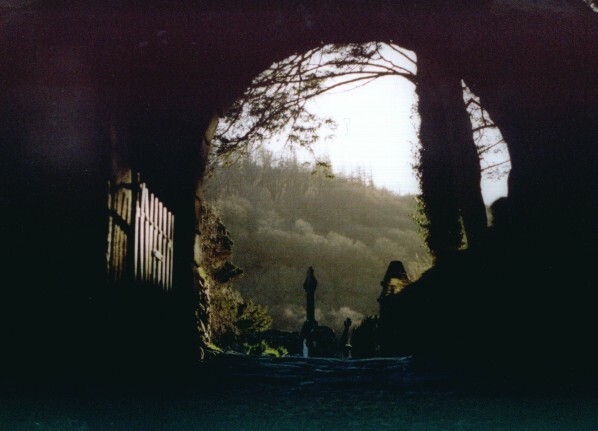 There has been much speculation abut where Michael Dwyer and his men hid in the Glen of Imaal. 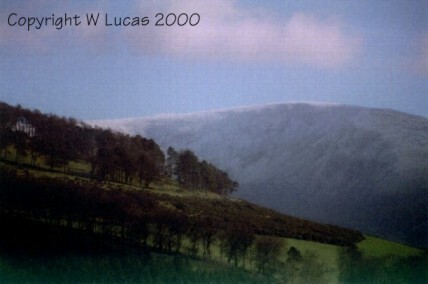 There was a cave used high up on Brittas Hill, another is reputed to be on Lugnaquilla (this has never been found) In The Glen of Imaal the river Slaney rises at the eastern end of the Glen, on the high slopes of Lugnaquilla. Glenmalure valley is one of the wildest and most beautiful. The river Avonbeg flows through it and where the Wicklow mountain road crosses the Glen a ruined barracks of the eighteenth century stands guard. 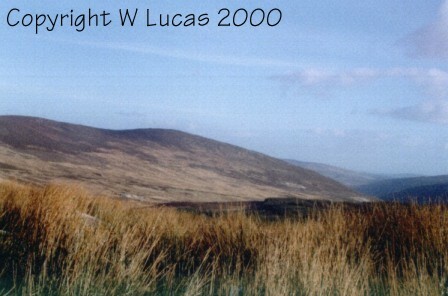 Lugnaquilla and Mullacor rise on either side of the Glen and deer vie with the sheep for food. There the road becomes a rough track leading into the Glen of Imaal. Glendalough the home of legendary St. Kevin's bed where Michael Dwyer reputedly rested while recovering from a wound received in the battle of the Glen of Imaal. Michael Dwyer was born in the Glen of Imaal in 1772. His father John Dwyer farmed there with a half mile of Seskin. The old farm ran down town banks of the river Slaney. His mother was a local Girl Mary Byrne. Michael Dwyer was the eldest of seven. In 1874 his family moved to Eadestown. His involvement in the fighting at the Glen of Imaal led to his being hounded by the English. Dwyer joined the United Irishmen and was deeply involved in the Glen of Imaal organisation. Fiction reveals the Glen as a wild mountain area but its generally acknowledged there were many prosperous farms in the area. The Glen itself is closed and is used as a shooting range by the Irish Army. It is owned by the State. Dwyer recruited a man named Larry Byrne and united the people of Aughavannagh and Glenmalure. Dwyer used the well known Black Banks as a quick exit to Glenmalure. The British Yeomanry lived locally. On the 29th May, 1798, word reached Dwyer of the success of the rebels at Oulart Hill and with his friends Dwyer spent the night in the cave in Lugnaquilla and with his friend walked to Vinegar Hill in County Wexford where he made contact with the combined Wicklow and Wexford forces. After the battle of Arklow Dwyer joined with a contingent of Wicklow men, this was to reduce the pressure in the battle of Hacketstown. The withdrawal of the rebels from Hacketstown resulted in one section returning to the Glen of Imaal. Byrne was separated from the main body and with a large force of crossed to Glenmalure. The following day they joined Dwyer in the Glen of Imaal. 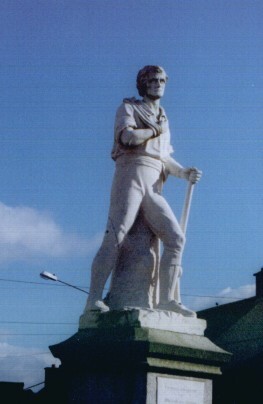 Dwyer was responsible for the defence of the Glen and this resulted in a regiment of highlanders being camped at the entrance to the Glen of Imaal in the town land of Leitrim. Their mascot was an Irish Wolfhound. In February 1799 Dwyer and companions took refuge from a snowstorm in Miley Connell's cottage on Hoxie's Farm. An informer told the garrison in Hacketstown where Dwyer was located Dwyers men were accommodated at houses convenient to Hoxie's Farm. A party set out from the garrison at Humewood, the sentry's were surprised and failed to raise the alarm. The troops surrounded each cottage and of burning the men surrendered. The troops agreed with Dwyer to the Connell family leave the cottage safely. Dwyer shouted out that he and his companion would fight to the death. Two rebels were shot dead and Sam McAllister was wounded in the arm. McAllister opened the front door and drew fire on himself and while the soldiers were reloading their muskets Dwyer escaped. The original cottage had 2 rooms - the kitchen was very large with a fireplace and folding bed there - the fireplace had a hob - it was nothing unusual to rear 7 children in these cottages - the bedroom has a huge wooden old-fashioned bed in it. The cottage was burned down many years ago and was rebuilt by the Board of Public Works, It now has three rooms. 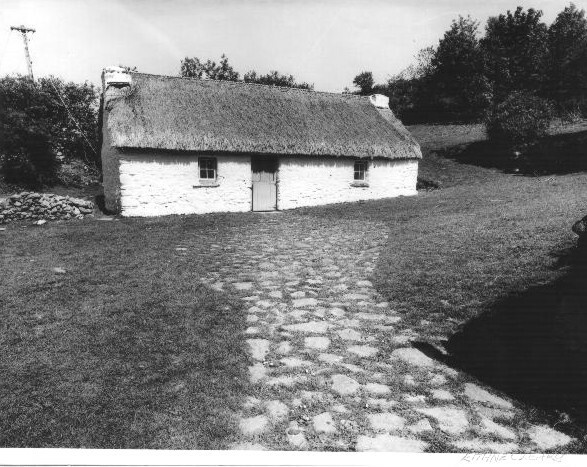 The photo is of the original cottage.